Starz has announced that they’re developing a new version of the Peep Show TV series from the UK. The original series’ creators will be consulting producers on the new version. Beverly Hills, Calif. – July 27, 2016 – Starz today announced the series development of “Peep Show,” a half-hour sitcom based on Objective Media Group’s award-winning British comedy of the same name. With the original series having aired its ninth and final season for Channel 4 in the UK, series creators Sam Bain and Jesse Armstrong (“Fresh Meat,” “Four Lions”) will be consulting producers on the US adaptation. Objective Media Group America’s Jimmy Fox (“The Arrangement,” “Killer Women”) and Layla Smith (“Witless,” “Marley’s Ghosts”) will serve as executive producers with Greg Lipstone, CEO of All3Media America. Eli Jorne (STARZ Original series “Blunt Talk,” “Wilfred,” ”Son of Zorn”) will write the pilot and serve as executive producer/showrunner. “’Peep Show’ gives a unique spin to relationship comedy – it’s a great opportunity for Starz to innovate in the half-hour space,” said Carmi Zlotnik, Managing Director of Starz. Shot entirely through a highly inventive first-person point of view from its two main characters, “Peep Show” has received eight awards since its premiere in 2003 including two BAFTA Awards, two British Comedy Awards and two Royal Television Awards. The series centers around two dysfunctional friends who share their lives while trying to adjust to the professional world. “We are hugely relieved to hand over the responsibility of coming up with the dark and twisted thoughts of two terrible men to the extremely funny, dark and twisted Eli Jorne,” Sam Bain and Jesse Armstrong said jointly. Objective Media Group is a London based production company founded in 1991 where it has rapidly become one of the UK’s most influential content creators. Objective Media Group America is based in Los Angeles and overseen by EVP, Jimmy Fox. Objective’s US arm is currently in production on the E! drama series “The Arrangement.” Objective is owned by global production and distribution company All3Media. All3Media is owned jointly between Discovery Communications and Liberty Global. All3Media America is the Los Angeles-based production studio for All3Media, a global production and distribution group of companies headquartered in the UK. Established in December 2012, All3Media America develops and produces a wide range of original scripted, non-scripted and digital content specifically for the US market as well as serving as the domestic production base for the group’s international formats. All3Media America companies include Bentley, Bogner Content, Commonwealth Unscripted, Company Pictures, ID-TV, Lime, Maverick, MME, North One, Objective, Seven Stories, South Pacific Pictures and Studio Lambert Associates. The company currently has series in production or development with a large number of broadcast and cable networks as well as digital platforms, including the Emmy award-winning Undercover Boss for CBS. All3Media America’s formats and finished programs are distributed internationally by All3Media International. All3Media is owned jointly between Discovery Communications and Liberty Global. What do you think? Are you a fan of the Peep Show TV series from the UK? Would you check out a new version? 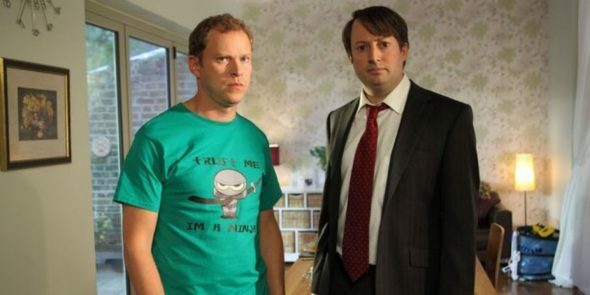 More about: Peep Show, Peep Show: canceled or renewed?, Starz TV shows: canceled or renewed?